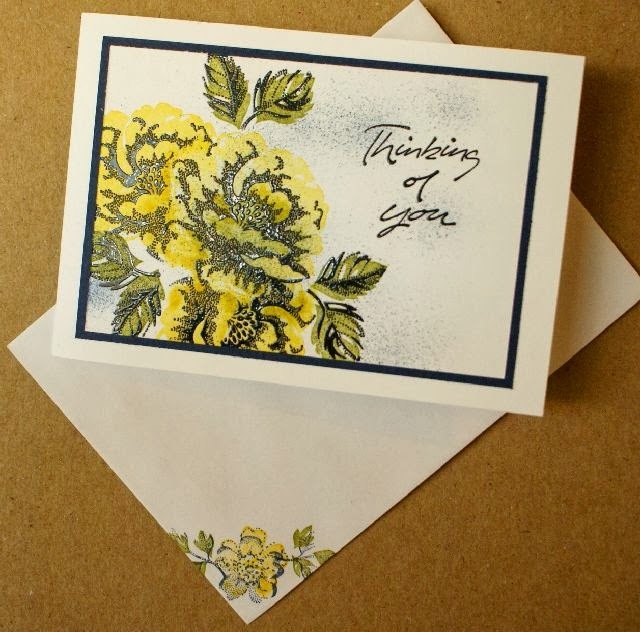 Susan's Saga: Stippled Blossoms Thanks! While I was up North visiting my daughter and new baby granddaughter (she is gorgeous, yes!) my sweet Mother asked me to make some Thank You cards fro her sister (who is, of course, my Aunt). I immediately thought of the Stippled Blossoms stamp set and some black embossing powder. I hadn't put those things in the Motorhome Craft Kit so had to wait till I got home to make this card. 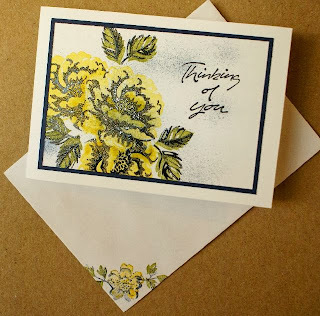 I used Daffodil Delight ink to make the background flower stamps, Old Olive for the leaves and Night of Navy cardstock to layer it on. I spritzed with Night of Navy as well to add some shadow effects. I'll show you my BIL's card next time. His celebration was tonight so I didn't want him seeing his card before he opened it first!